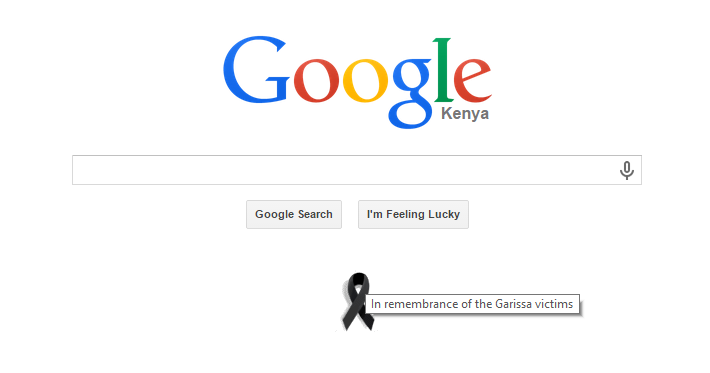 Google Kenya has today honored the Victims of the Garissa attack with a black ribbon on its homepage. The ribbon has an image tag that reads “In remembrance of the Garissa Victims”. Google joins other major brands that have used their websites and digital platforms to honor the memories of the Garissa victims. Last week on Thursday, Kenyans woke up to the horrific news of an attack at students of the Garissa University College in which 147 people lost their lives. The digital space played an iumportant place providing news and information on the attack. It also provided a platform to remember the victims of the attacks through hashtags and condolence messages. We here at Techweez send our sincere condolences to the families and friends of the victims.